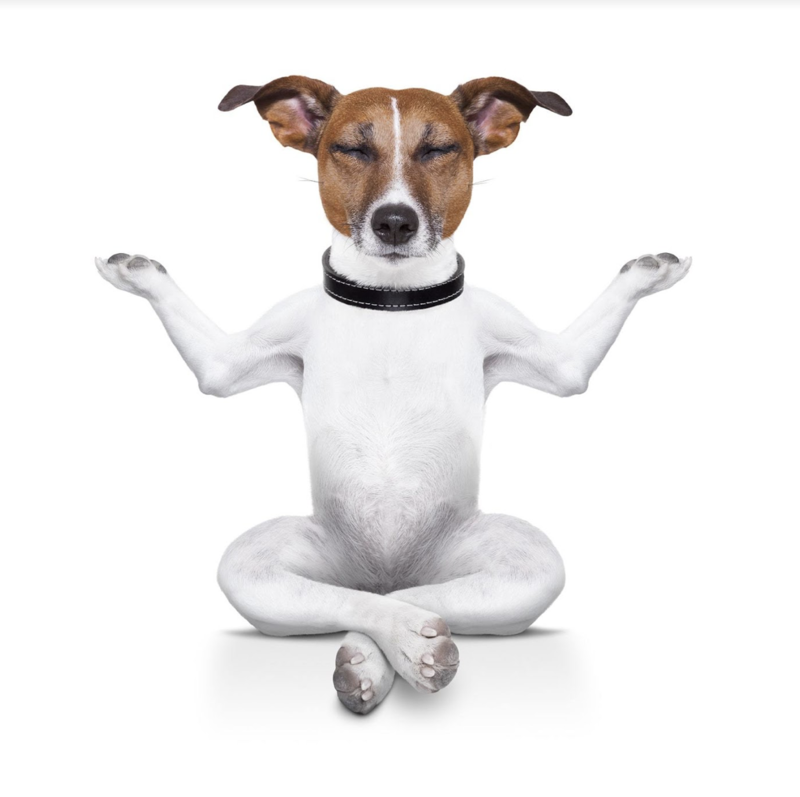 Yes, you can do yoga with your dog right here in Raleigh! At Woofinwaggle, we are happy to host special yoga classes! We’re committed to providing dog parents and their pets with a full selection of fitness classes and activities. Our goal is to help dogs and their parents of all ages and fitness levels achieve better health together in a welcoming and fun environment. It is also our goal to encourage and improve the human-dog bond creating a healthy and happy pup. If your a long-time yogi or new to yoga, you and your pup are guaranteed to love this special guest hosted class! Join us for an hour of stretching, strengthening, and breathing with your dog! Only $20! -No yoga experience is needed from you or your pup. -This is a no-judgement zone. We don’t mind if your pup barks! -Class is limited to 1 dog per person, per yoga mat (Bring your own mat). -Dog must be attached to you via belt or runner’s leash. -Great bonding experience for you & your canine. Sofia’s teaching emphasizes how even the smallest shifts in our minds and bodies can have a profoundly positive impact on how we live our lives. Her alignment-based classes build heat slowly and uncover how seemingly simple postures, when explored with intention, stir up endless goodness in our bodies. Sofia is honored to support her students and their pups as they use yoga to move, giggle, and play in a safe and loving space. Sofia discovered yoga in 2010 while living in Brevard, NC and working as the Staff Director for a traditional, residential summer camp serving girls ages 6-16. Sofia noticed that many of the young women in her care struggled to adequately describe the emotional landscape of their lives. Many were also disconnected to the nuanced sensations within their bodies. Where spoken language left off, yoga became a tool for Sofia to help others explore, reflect, and integrate the lessons of their lives. Through Kelly Golden and Vira Bhava Yoga, Sofia was certified in 2018 in the tantra yoga tradition. Tantra teaches its students to weave all aspects of themselves and their experience into their yoga practice. Subsequently, this philosophy encourages students to love themselves in the entirety of who they are. Sofia is grateful for her amazing partner, Lyle, who brings so much levity and joy into her life that it flows directly into her teaching style, and for her dog, Coach, who always teaches her new stretches to access the body. Sofia is beyond humbled to be a part the Woofinwaggle family! Sign Up for Our Yoga Classes!